If you wish to visit Canada from most countries you will need to gain a visa. Whether you are looking to work, study or simply visit as a tourist you will need to make your application perfect if you are to be granted your visa. Your letter for tourist visa application will need to clearly show your reasons for visiting and give clear proof that you will be able to support yourself. Your Canadian visa purpose of travel letter must also give the reader a clear understanding of the reasons why you will return home when the visa expires. If you are unable to convince the immigration officer in the embassy that you are a genuine visitor through a well-written letter then you are not going to get your visa. Many applicants seriously struggle to write their Canadian visa travel purpose letter and this is one of the reasons so many get their application rejected. If you are not sure with what your are doing it is often best to get help to ensure that your letter and your visa application will be accepted. Our visa application service can help you with ensuring that you cover all of the requirements for your TRV application. We offer professional support through highly experienced consultants that fully understand just what is expected of you for your application. We are confident that we can help you to submit a Canadian visa purpose letter that will fully meet their expectations and boost your chances of success. 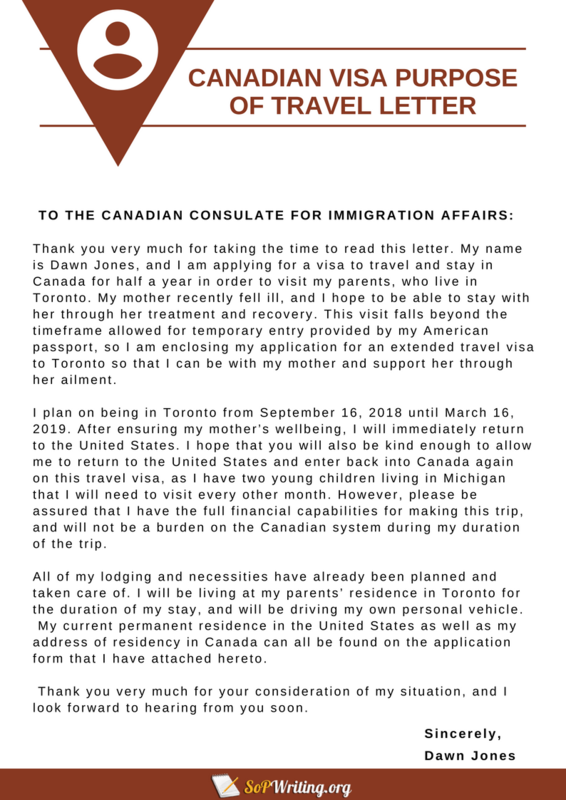 Writing letter to Canadian embassy for purpose of visa does not have to be difficult if you follow their guidance with care and fully explain everything that they ask for. Their main expectation is for you to be able to show your intention to return to your home country once the period of your visa is finished. If you cannot persuade them that you intend to return home through your letter then you will not have your visa issued. Reasons for visiting: you should clearly state your reasons for wanting to come to Canada and these should be in line with the type of visa that you are applying for. If you are coming to visit family then you should clearly specify who they are and their status in Canada. Travel itinerary: this should be a detailed plan of what you intend to do during your stay in the country. It should show your travel plans on a day to day basis and where you will be intending to stay. If it is a vacation then it will help if you also include estimated costs to show that you have considered it. Sponsor: often you will be coming to visit a member of your family. If they have legal right to stay in the country they can help significantly with your application. You should include their names, address and legal status within your letter, especially if they are going to be financing part or the whole of your trip. Financial details: unless you can show that you have the money to support yourself during your visit you will have your visa denied. They will want to see that you have money in your account and where that money has come from. A single deposit into your newly opened account by a friend is unlikely to provide that confidence. You need to show regular payments into your account from your employment. The incentive to return home: they want to know what ties you to your home country. The stronger those ties the more likely you are to be granted a visa. They will want to see that you have property, family, business, or stable employment. The more you can show the better. Previous travel: if you have previously been to other countries that require you to have a visa such as Australia, UK, USA, or Europe and have kept to your visa conditions then this will help your application. What Must Be Included with Your Canada Visitor Visa Purpose of Travel Letter? Your letter to embassy staff will rarely be a simple letter. If you look at our purpose of travel Canada visa sample letter you will see that it has many attachments. It is very rare that you will be able to get away with just a single letter. Often you will have to make many additional letters and provide additional evidence. Need some help with your Canadian visa purpose of travel letter? Feel free to get help from our writers at any time! Why Might Your Visa Be Denied? Failing to show that you have sufficient funds to support yourself: it is not enough to state in your letter what your monthly income is and what your savings are for your holiday. You must prove it. This means providing bank statements that show regular deposits as well as your current balance. You may also need a statement from your employer to indicate your wage or certified accounts from your own business. Failing to show ties to your home country: the main reason for the visa is to prevent people from entering the country that has no intention of returning home. You must show evidence of your ties. This could be ownership of a business, letter of employment, property ownership, children and other family that you support. Show formal certified evidence to support your letter. Not showing clear travel plans: you need to show that you have carefully planned out what you will do and what it is likely to cost you if you are seriously considering your visit. Not providing clear and feasible plans will prevent your visa being approved. How Can We Help You with Your Canadian Visa Application? Whether you need to learn how to write statement of purpose for Australian student visa or need someone to review your Canadian TRV letter we can help you. We have been supporting applicants for several years and our visa application consultants know all of the ins and outs of gaining your visa. They will be able to work closely with you to ensure that you fully cover everything that they want to see within your letter and will help you to ensure that your evidence will be of the quality that the embassy will expect. Fully confidential support: we never share your personal information with any other parties. Highly affordable rates: we charge some of the most competitive prices for our services. Unique letters tailored to your application: we supply your letter with a plagiarism report to show it is unique to you. A rapid turnaround: we will complete your visa letter quickly and effectively and get it to you within the agreed deadline. Satisfaction guarantee: we provide you with unlimited revisions and will refund your money if we cannot supply you with the letter you expect. 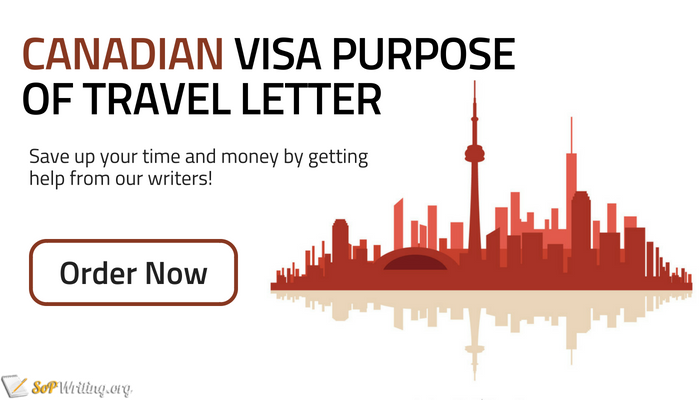 Get your application approved with the help and support of our experts for writing your Canadian visa purpose of travel letter effectively and quickly.